I suspect that many people would consider the preparation for an endurance event is purely about getting physically fit enough to complete it unscathed (or at least reasonably so), but it is more than that; it’s about acquiring the skills needed, for example map reading and navigation, it’s about making sure that you are mentally up for the challenge, so ironing out any confidence issues and weaknesses, and also testing the kit that you need to make the event as comfortable as possible. Although I’m an ex-cartographer and photogrammetric surveyor, who can interpret maps, and has a pretty good sense of direction, I haven’t yet learned to triangulate my position or plan a route using a map and compass. OK, I suspect that following coastal paths isn’t going to be particularly challenging navigation-wise, but if I had to deviate off course for any reason I don’t want to end up walking miles further than I need to because I have no idea where I am. Also it would be extremely embarrassing if I got lost and had to be rescued by the charities I’m raising money for. Could you imagine! I’d never live it down. I may even have to leave the country out of embarrassment. So over the summer, one way or another, I shall learn to map read. Mentally I think I’ll be OK. I like being on my own a lot of the time, I don’t get lonely, so I don’t think walking miles without seeing anybody will faze me. Plus, historically, once I’ve set my mind to something I do it and I figure if I have managed not to quit uni despite the many times that I’ve wanted to I can stick with a long walk…oh my, I may well write a blog post all about the “joys” of formal higher education. To give you some idea of how I felt at one stage, I had said during an offload that I’d rather hit myself repeatedly in the face with the brick than try and get my head around statistics because it would be marginally less painful! I had a love-hate relationship with uni. 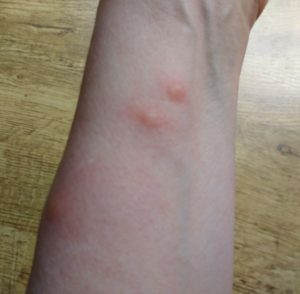 Hurrah, it turns out that I hadn’t caught the pox after all and the lumps were most likely from mozzies! Consequently I didn’t wake up dead, or with a big red cross painted on my front door. Or found a group of dodgy looking men in hazmat suits loitering outside. This is good news because it meant my training could continue, and a few days ago I walked a lovely 9 mile circuit of Kinver in Staffordshire, a walk I had done with the South Birmingham Ramblers a few days previously (thanks to the leader that day, Peter Rookes, who gave me his notes so I could follow the route alone as part of my training). So, on the 4th June I, slightly nervously, went off to walk the route alone. This was an important test because I had never walked so far in the countryside alone before and needed to know how I felt about it, whether I could follow a planned route without going off piste (or at least not too much off piste), and whether I could hold my nerve walking through the field of young cattle I’d encountered previously…incidentally, did you know that cows have rough tongues?! Anyway, thankfully it felt great and I loved every minute of the walk, which galvanised in my mind that I will be happy walking miles alone. My plan was to show you the route and elevation but unfortunately my Garmin ran out of battery half way round…makes note to self that half full does not last 9 miles!…but this will be my regular training ground due to the quad-burning steep bits so I will definitely post it here soon. I appear to have caught the pox! Take heed…before undertaking a 13 miler along the canal, make sure you have all your jabs up to date because, disaster, I appear to have caught the pox! My friend thinks it’s mosquito bites but I fear it’s worse than that and I may not have long of this world. When the time comes I wish for my body to be dumped in the nearest field and eaten by scavenging animals. In the event there are a shortage of vultures, I’m more than happy to go through the digestive system of a variety of corvids. My epic walk plans were short lived but it’s been fun. Farewell…. …is the pox supposed to itch this much? !